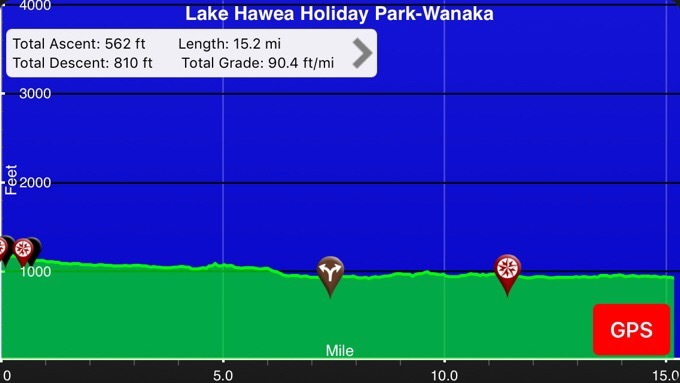 Elevation chart courtesy of Guthook Hikes Te Araroa App. I feel like a broken record, but it was another great day! 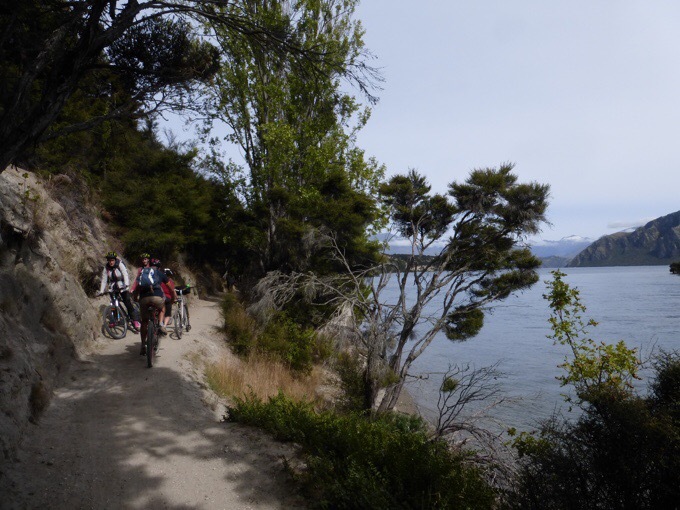 Basically, the 15mi/24km from Lake Hawea to Wanaka is a riverside stroll along a gravel bike path with great views. 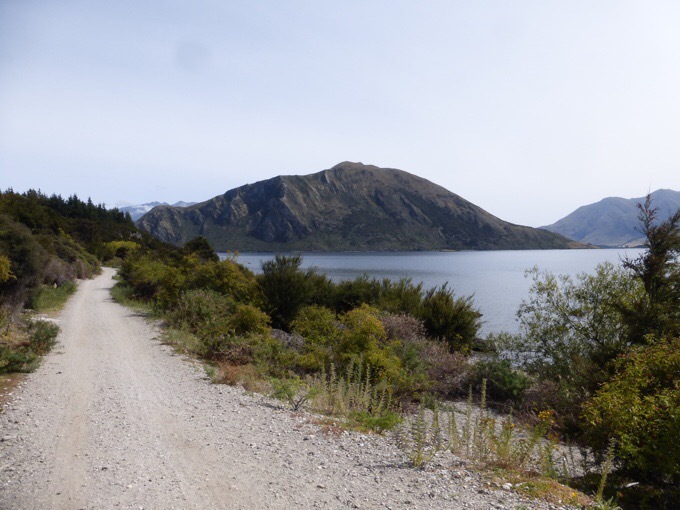 We slept in and started hiking at 8am knowing that we had a shorter day and couldn’t check into our motel until 2pm in Wanaka. It was a crisp morning again, and we were in our down jackets for the first 40 minutes until it warmed up a bit. It was just great walking! Both of us are constant thinkers it seems with our minds always thinking of multiple things and strategizing this trail and life. It was funny that as soon as we got on the effortless track both our minds were running with scenarios of how to make side trips happen around this area. Once we talked that topic to death and theorized every option, I was excited to put the “multi-tasking terrain” to good use and write yesterday’s blog post using the voice to text dictation on my phone. We spread out a bit while I did that and Griggs had some Spanish he was learning and speaking aloud. 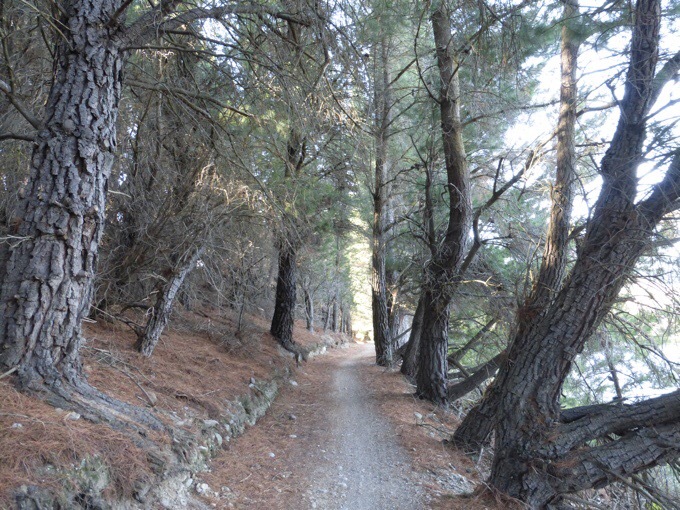 It was fun for both of us to get this kind of walking in that is relaxing and energizing at the same time. As for the side trips, we have checked the weather and proposed ideas in various combinations and permutations to make your head spin. Since weather isn’t good for Mt Aspiring National Park tomorrow, we have decided to go ahead and hike the few days to Queenstown. It does seem that we will have about four days once in Queenstown before Becky’s birthday. If weather cooperates, we would then be able to jump up to Mt Aspiring National Park and get a short trip in. If the weather is still not good, Griggs will hike on to finish the trail, which is only two more weeks, while I find things to do while I wait for Becky and Tom to catch up for about 10 days. Those that know me (especially those that have hiked with me) know what an anomaly this is that I would hit the pause button for over a week on a trail. In my gut I know this is the right choice and I want to finish the last two weeks with Becky and Tom. Even if I were to move on and finish the hike in two weeks, my plan would still be to come back here and hit the side trips in this area. All along, the goal had been to move ahead to be able to do my side trips knowing that if I’d stayed with Becky and Tom the whole South Island, I would not have had time to do the side trips I’d wanted. It is common for people to have to wait in this area for weather windows to get to the good stuff. If weather isn’t great, and I need to wait a couple days, I need a couple days to get Tasmania researched more and get all of my travel booked. I think I could spend two days alone just trying to figure out my itinerary for Tasmania. The sooner I do that the better, so that should happen in the next week or two. I do feel that I’ve been “in the pocket” on this hike. I like to use that term to describe how things just seem to fall into place very well if I do what I’m supposed to do on my end and put forth the right energy in the right direction. I can’t believe how fortunate I’ve been given the weather to not have to take any days off. 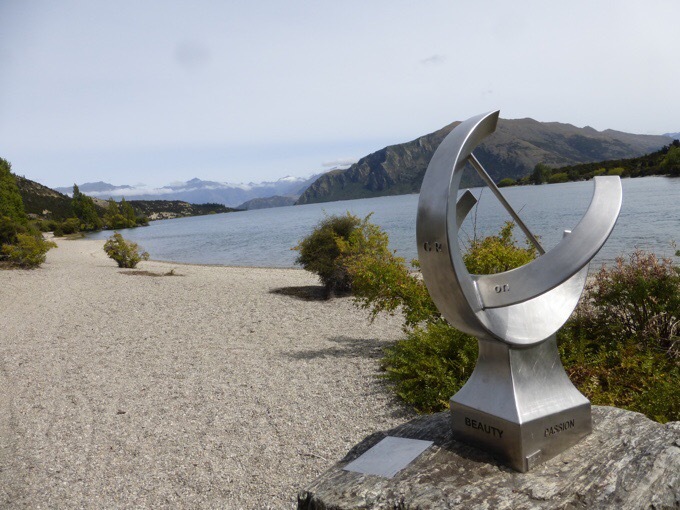 Also, to have been able to seamlessly complete both the Abel Tasman and Mt Cook side trips in great weather. I know that being or New Zealand will require waiting for some weather to clear to get my window at times, and it may be my turn to wait once I get to Queenstown. I’m excited for these final few weeks, and I’m open to being flexible, which is pretty big for me. It’s going to be worth it to wait for Becky and Tom, and I’m confident and happy in that decision. Now we just need weather to cooperate next week! 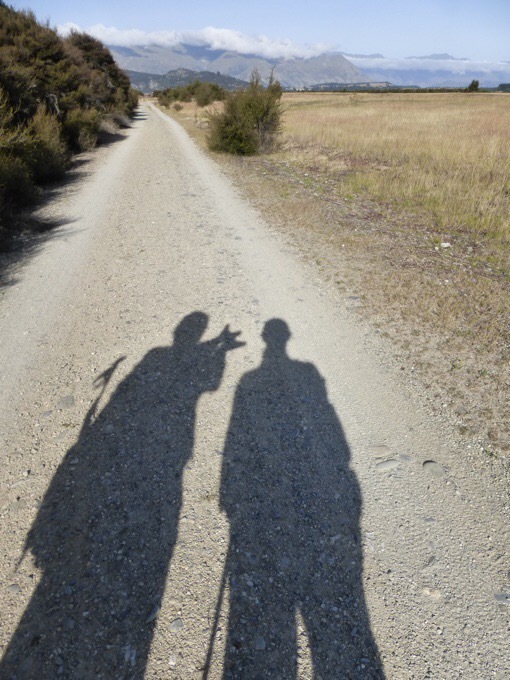 As for today, we had a great time walking along the Hawea and Clutha Rivers on the way to Wanaka this morning. Many people were out along the track running, walking dogs, and biking. It was really pleasant and made me super happy to walk along it. I think it’s also the culmination of such a great string of days recently that just gives that extra boost in my step. Just really happy! Becky will be back soon! 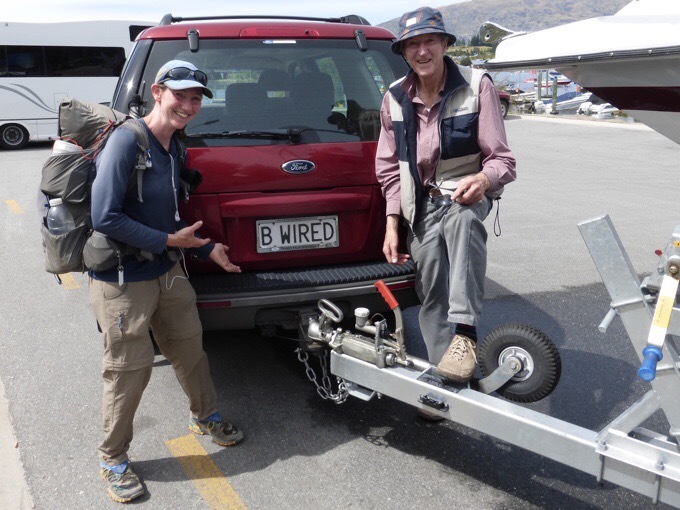 As we walked into town and past the Yacht Club, we came upon a car with a license plate that said “B WIRED.” It turned out the owner was a retired electrician (called a sparky out here) whose daughters gave him that plate as a Christmas gift many years ago. Fun to see that! We hit town at 1pm and intended to eat at a local place, but were surprised to see a Subway and both were really happy with that. I know, it’s sad, but it’s comfort food and makes me oh so happy. 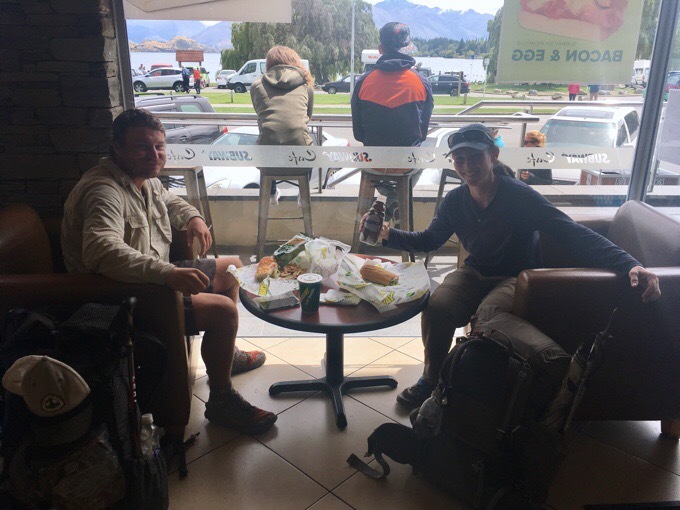 I haven’t had Subway since exiting the Tararuas 38 days ago. It was quite wonderful with chocolate milk and cookies of course. Today, Griggs hit the 5,000mi mark of his cumulative long distance hiking miles, and that was pretty cool. He’s been racking it up quick having hiked most of the last two years and soon hitting the Continental Divide Trail this spring in the US after this hike. He just keeps going! We got our groceries done and were checked into the Bella Vista Motel just after 2pm check-in. We proudly nailed the timing and optimized our town time today. The motel is nice, but had problems with the wifi today, and that’s frustrating. Pretty much on par for South Island wifi it seems, but disappointing for a place that advertises free unlimited wifi and then completely drops out 50% of the time. We ended up using our own data much of the time. 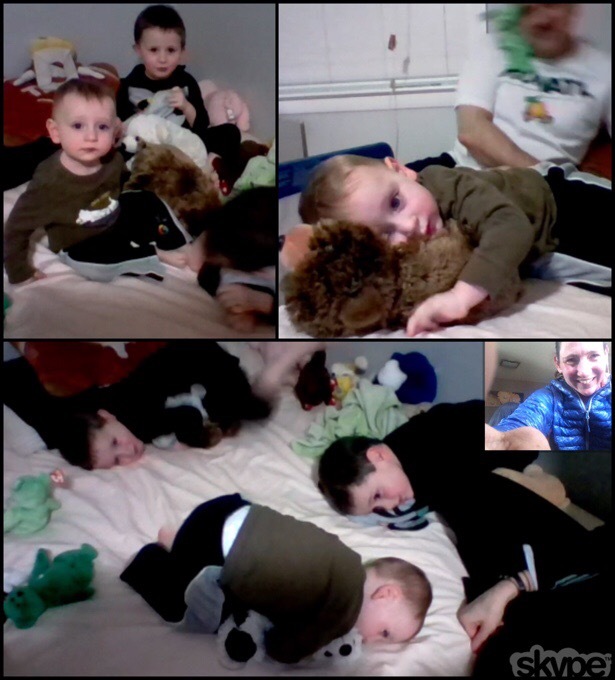 I stayed in the motel and Skyped my nephews just before their bedtime and got caught up on blog and correspondence. Bedtime snuggles of my nephews. Griggs got lots done in town. He bought new shorts (his tore almost in two about two weeks ago), updated his phone’s SIM card, got a haircut, and shaved (I didn’t get a photo yet!). While he was in town he ran into…Felix! We didn’t think we’d catch up to him again and somehow did. Felix has one foot that bothers him on the steep and sidling trails, so he had some shorter days. It looks like we may overlap again the next few days to Queenstown, yay! 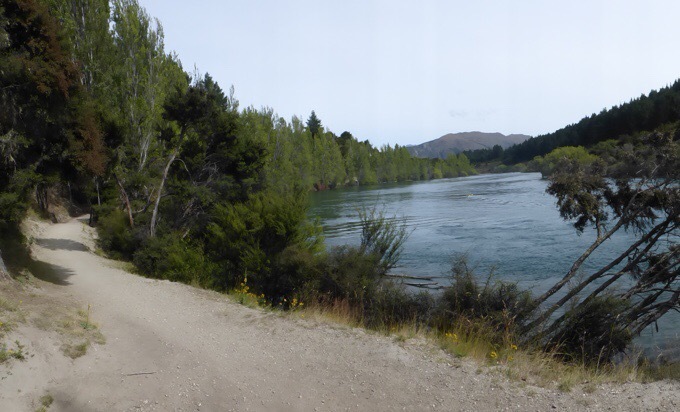 No new updates from Becky and Tom to pass along other than that they should be around the Rangitata River and either fording it, or doing that convoluted and time consuming hitch around that we got lucky on. They have moved on from the group they were with to do bigger days. 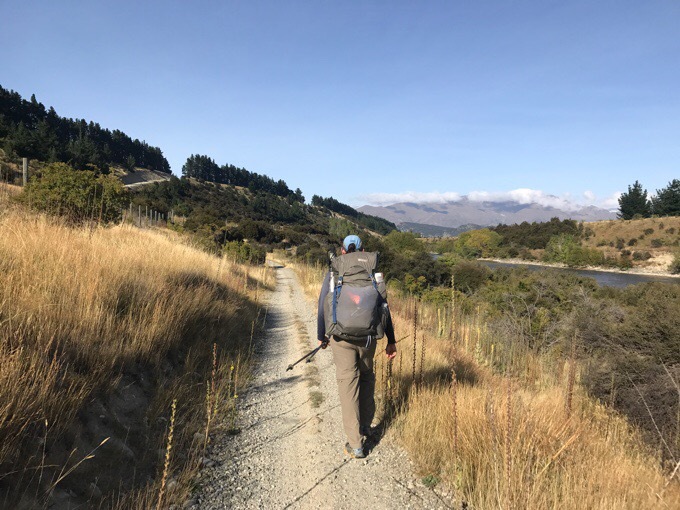 Christophe had an unfortunate incident in the the Harper Valley area when he left his pack in a hut near Arthur’s Pass (Avalanche Creek Shelter) while he took a side trip to summit a mountain. While he was gone, someone stole his whole pack! He is off trail for a month working to replace what was stolen. So terrible! I should have more of an update from Becky and Tom in a few days once in Queenstown. It was a good day to get some rest in before this short, but strenuous upcoming leg to Queenstown. It may be a few days without service, so there may be a gap in the posts. What a difference a few weeks makes. It’s great to hear how settled and how happy you are. I’m sure less rain has helped, plus those ridges and views. It’s fun to share in all your partnerships. LOVE that you are prioritizing the reunion. Bummer about Christopher 🙁 Yippee about Felix! Trying to embrace something new and let things fall as they will! Do you know if Christophe had expensive gear? I think he was on the cheaper end. You can email Becky to know more. Actually, I’m going to ask her about it and get his contact info to find out more since so many have responded asking about it. “Trying to embrace something new and let things fall as they will!” Right on!!! You may not get this in time, but if you can plan for it and book in advance, stay at the Adventure Queenstown Hostel in Queenstown (obviously). It is the bomb. Best hostel in NZ in my opinion. We’ve gotten to know the owner (Bret) really well since we work in the business in the US and he’s got it nailed down right. Best part: unlimited and speedy wifi!!!! Yeah, all hostels were booked up a few days ago for like a week so we booked a hotel. is there a link or address for donations for christophe’s gear replacement? I’m going to work on that since I’ve had so many inquiries. I need to get details and his contact info from Becky and will update it on the blog hopefully on one of the next few days post. I feel so sad about the backpack snatching. I’ve always loved that traditionally hikers could leave their pack to go get water, or even climb the last part of a mountain. I know I’d be super paranoid but hate that it happened. You definitely seem to be broadening your experiences.. good thing. Ah.. in my comment on the day before this I started to ask if possibly Felix would be able to make Becky’s birthday and then thought .. nah.. and didn’t include that, so imagine my delight in reading that he will get there. What a great reunion for all of you. Not a local trail in the least but I’m sure you know there is a duo trekking the length of North, Central and South America.. I get a blog entry now and then. Where they have been .. definitely more issues with private property and things changing and not always good info.. That is a LONG hike! Yeah, I’m looking into getting a contact for Christophe if anyone wants to help him replace the gear. Becky’s bday is still 6 more days away, so sadly Felix will be well away from Queenstown by then. Griggs and I will be doing side trips while we wait. Yes, I know Fidget and Neon who you’ve mentioned, and yes, it’s long and much of it has very little beta for doing it as a thru hike. My friend Buck-30 has recently overlapped with them and they have helped him, but he’s also had lots of trouble with beta and even being escorted by police off private property. His blog is on postholer and he’s always and entertaining read if you’re interested. It’s just not ready to be a hike yet. I’ve been following Buck-30’s Greater Patagonia Trail hike, the northern half has been a bit disappointing for him unfortunately. The trail and logistics sound very raw with not a lot of payoff, but he’s going to head south and see if that’s better. I hope it works out for him and his partner, Skittles, they came a long way to do it, perhaps they’ll hit the jackpot in Patagonia. Yeah, we are good friends. He cracks me up at times with his brutal honesty and that’s what I love about him! Yup, hilarious, he really says what he’s thinking and tells it like it is. Skittles also posts but on trailjournals.com, it’s great to read both takes on the trail and their experiences together. They’re both flying by the seat of their pants out there, it’s a very untamed trail, not unlike the one you’re on. Yeah, they both do that and I love the transparency! Ooh, so sorry to hear about Christophe’s pack. Rotten thing for anyone to do, very unusual here in Europe but sadly no longer completely unknown. 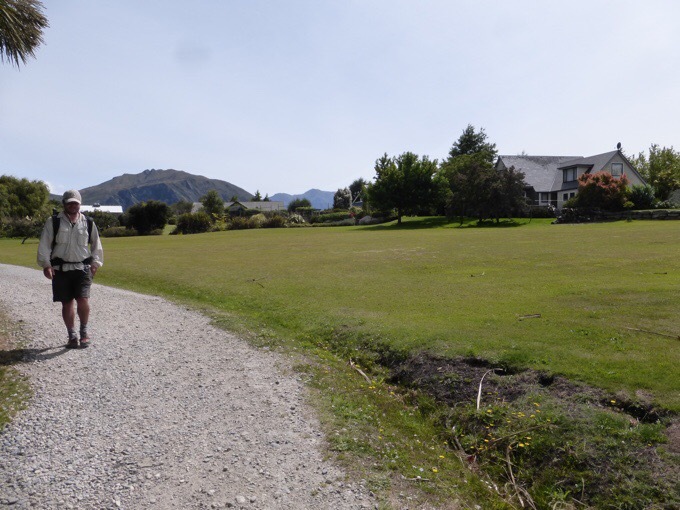 Glad you are enjoying the walk more now Erin, you have had some fine walking terrain the last few days..
You should book ahead for Queenstown as it’s always crazy busy this time of year. Agreed! Even ahead of time, we had to go with a motel instead of hostel. It’s jam packed! Random question…I have Fizan poles and have wondered if there any replacement tips from made by brands in the US that are compatible? 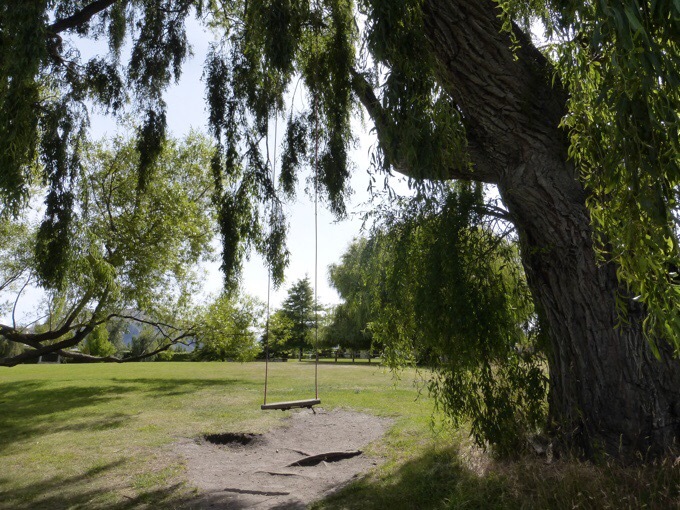 Also, if you are killing time around Q-town I’d recommend staying in the much more layed-back and quaint village of Arrowtown (TA Km 2648 I think)… ~20mins to Q-town via city bus. Yes other tips do work. I just use Black Diamond pole tips for mine. I actually changed to that immediately because that’s what works with my StickPic attachment for my camera. Also, we are camped just above Arrowtown tonight and will walk through tomorrow on the way to Queenstown. Good idea for cheaper lodging on my extra days though. I wonder if it’s the same Christophe that stayed with us, a German guy (maybe mid 40’s with a beard) he and 3 others stayed a night, Bettina, Malté + 1 more (name escapes me). I hope you get to do a side trip, while you’re waiting for Becky and Tom to catch up. I hope Felix’s foot/legs comes right soon. No, Christophe is 23 and French. 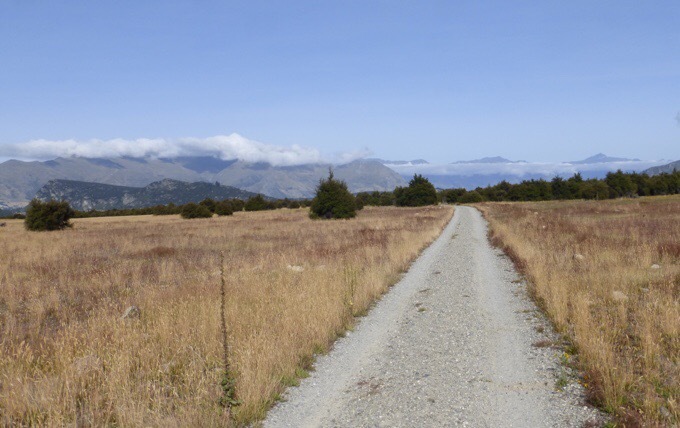 We just booked the Kepler Track to do before Becky’s bday! I got Christophe mixed up with Christian. 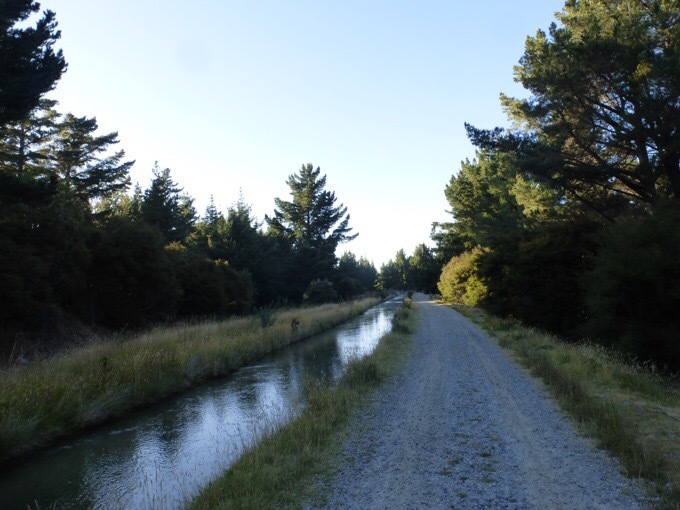 Cool that you’re doing the Kepler track, enjoy. Griggs is hitting the CDT next? Me, too! What date!? Nobo? He starts May 5th and you two would be the same pace. He flies! I’m going to be pushing the comfort levels with a later start – as late as the 3rd week of May. We shall see.The San Juans are even snowier than normal! I’m going to hike from Zion to Flagstaff as a pre-hike. Keith is going to push me out on the side of the Interstate as he cruises down to Mount Laguna! Enjoy your week with a little more down time! That’s the idea! 🙂 In other Leslie news I’ve been at home healing a broken elbow for a month!